Experts in ERP and change management share their tips on how to choose and deploy an ERP system to maximize your investment. Plus, they outline steps you can take to improve the chances of workers will actually use the software. Deploying an enterprise resource planning (ERP) system is an expensive proposition, not just in terms of licensing dollars (SLA) and maintenance, but in terms of dedicated resources and time. And yet all too often, organizations, dazzled by vendor promises and hype -- Deploy our ERP software and your manufacturing business will instantly run smoother and increase profits! -- fail to come up with a viable long-term (or even short-term) roadmap. So to help organizations increase the odds of a successful ERP deployment, with the help of dozens of ERP and change management experts, we came up with an ERP selection and implementation tip sheet. Here are nine tips on how to choose an ERP software solution and successfully deploy it. 1. Get upper management support. "Companies that tend to struggle the most [with ERP] are the ones that lack upper management level involvement," says Daniele Fresca director of Marketing, IQMS, a provider of industry-specific ERP solutions. "Resources at the lower level tend to not be edicated and engaged with the implementation project without senior level involvement," she says. That said, "executives don't need to get to the point of knowing every single configuration detail. But [they need to] be aware of the issues that are causing delays to the project." 2. Make a clear and extensive list of requirements before you start looking at vendors. "Begin by carefully defining the scope of your project," says Ed Talerico, director, Industry & Solution Strategy, Infor, a provider of enterprise applications. "Focus on specific business processes and system requirements. The more specific you can be upfront, the more detailed your vendors can be in their proposals." "If you get one thing right, make it the up-front requirements gathering process," says Brian Shannon, principal business process management architect, Dolphin Enterprise Solutions. "Few things derail project budgets and timelines as the 'assumptive' or absent requirements." So make sure you engage with end users, IT and senior management. "Too often, people select an ERP system based on factors such as price, current technology buzz or the system that is the flashiest," adds Fresca. "But without a good fit, companies are left with expensive customization and bolted together solutions," she notes. The solution: "Find an ERP system that is industry-specific, with tools and features designed to solve your business requirements. The ROI and long-term benefits of a good fitting system are extensive." 3. Don't forget mobile users. "As mobility and BYOD increase across industries, accessing ERP systems from desktops only is no longer an option," says Ilan Paretsky, vice president of Marketing, Ericom Software, a provider of access, virtualization and RDP acceleration solutions. Choose an ERP solution that "allows users to be productive on smartphones and tablets." Yet at the same time will ensure that sensitive information is secure. 4. Carefully evaluate your options before selecting your ERP system. "Poorly run and ill-defined evaluation projects can lead to poor implementations," says Tom Brennan, vice president of Marketing, FinancialForce.com, a provider of cloud-based ERP solutions. "Dicey requirement definitions and vague priorities can lead to the wrong vendor selection." In addition, "lack of participation and input from key stakeholders in the evaluation stage can lead to poor acceptance and user adoption. And don't forget that delays running the evaluation project itself ultimately delay the go-live date and the time to benefit." "Another item many organizations miss during the selection phase of an ERP system is reporting and metrics," says Tiffani Murray, an HR technology consultant. "What do you want to be able to gauge from the system? Is this possible via the existing, prebuilt reports in the system or will you have to pay extra to get custom metrics that will drive your business, hiring and resourcing? Find this out in the selection phase and not after you've signed a multi-year contract." Also, do not forget about integration. An ERP solution that does not work with your existing legacy and/or critical office systems is not a solution but another expensive piece of unused or unusable software. Finally, "find a partner that specializes in your industry," says Jim Shepherd, chief strategy officer, Plex, a manufacturing ERP provider. "Better yet, find one that is dedicated to your industry. Those trying to tackle the entire ERP world can't offer the same expertise." 5. Get references. "First and foremost, when shopping for an ERP solution provider, ask the vendor for at least three references," says Reuben Yonatan, founder, GetVoIP.com, a VoIP shoppers guide. Then "ask the customers what went right, what went wrong and what they might have done differently. If a vendor can't provide at least three verifiable, happy customers, they may not have the experience you need." Similarly, if you are a member of an industry association, ask colleagues for ERP recommendations. 6. Think before you customize. "Consider the amount of customization required to configure and deploy," says Steve Bittner, vice president of Professional Services, Unanet, a provider of Web-based software for managing people and projects. "Highly customized systems will generate higher cost, not only in the initial deployment but when upgrading from release to release," he says. "Those businesses with unique requirements need to consider whether those requirements can be mainstreamed to eliminate the steep cost curve," Bittner says. In addition, businesses need "to understand [their tolerance] for longer implementation cycles, longer ROIs, more instability, [which can come with customization]," he says. "A turnkey solution may offer less flexibility but more stability, and less initial and ongoing cost." "Generally speaking, many companies' basic business processes are virtually the same (like paying invoices, collecting revenue and procuring supplies)," says Greg Palesano, executive vice president, Applications Services, HCL Technologies, a global IT services company. "This is why ERP was built in the first place. Companies can take advantage of standard processes that are leading class and have been tested by many other companies," he says. "If a particular business function believes they have a case for a customization, make sure they prove it," he argues. "Remember, the cost of the customization is not only writing and testing the code for initial implementation, but providing long-term support of the custom code and treating any customizations as exceptions every time you upgrade your software," he says. "Keep it simple and try not to allow customization into your ERP program." 7. Factor in change management. "Organizational change management is pivotal to the success of your project," says Matt Thompson, vice president of Professional Services, EstesGroup, an ERP managed services and technology solutions provider. "Typical ERP projects facilitate massive change in organizations that can include changing of day to day job descriptions or eliminating job descriptions in total. [These] changes impact the culture of your company and without careful control and communication plans and workshops you can create an adverse reaction to ERP [resulting in] barriers [to] implementation and adoption." 8. Appoint an internal ERP product champion -- and surround him or her with good people. "Do not rely on the vendor-appointed project manager only; have someone on your staff for this," says Morris Tabush, principal, the TabushGroup, a provider of managed IT services. Select someone within the organization, who knows or is comfortable managing software systems, to serve as the project manager," he advises. "This person will be responsible for "collecting all the end user requirements, learning the new system inside and out, working with the vendor on data conversion, coordinating training and acting as the point of contact for all employees." "One of the most common mistakes made by companies during ERP implementation is spending significant time, energy and money selecting the right software and implementation partners, only to assign their own 'B' team to the program," adds Palesano. "This results in numerous issues during design and implementation, slow decision making and delays. While it's difficult to free up your brightest resources from their full-time jobs, ERP implementations are not simple and they can be extremely expensive," he points out. So it's important to "put your best people on the job. Not just your best IT people, your best people, period." 9. 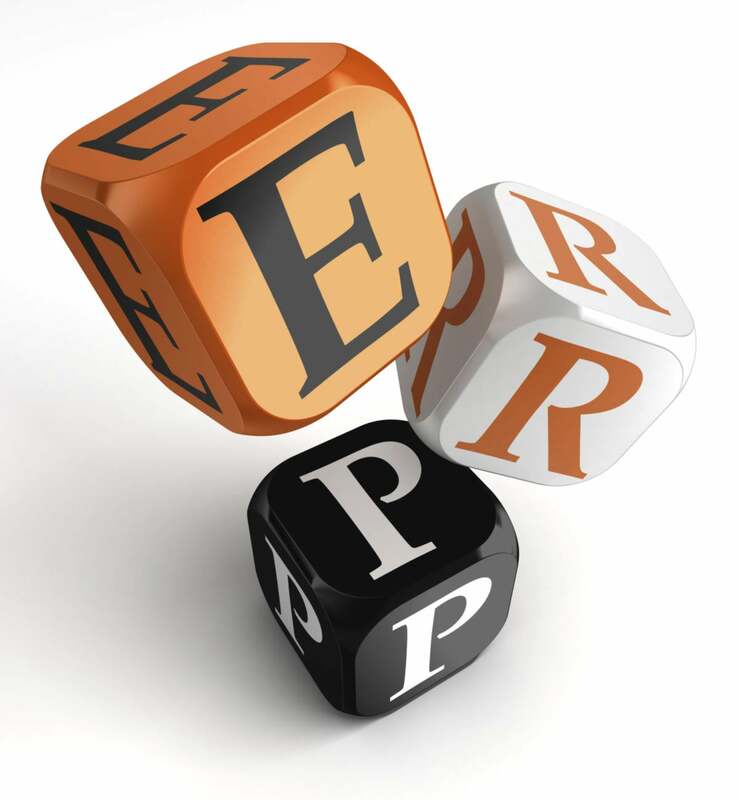 Provide the necessary time and resources for training on the ERP system. "Learning a new way of operating will require a significant time commitment for everyone, so the project team must take proactive measures to reduce the burden on employees," says Joel Schneider, cofounder, Liberty Technology Advisors, an IT consulting firm that specializes in ERP, business processes and project rescue. "Identify department-specific needs, allowing for sufficient time to develop and deliver training programs." Furthermore, it's important to "recognize that the most effective training may not come from outside sources. Tech-savvy employees within departments can be given the opportunity for more in-depth instruction to become expert resources for their fellow employees," he explains. "Having a readily available support contact within an operational group reduces the 'us vs. them' dynamic that can poison the implementation process."